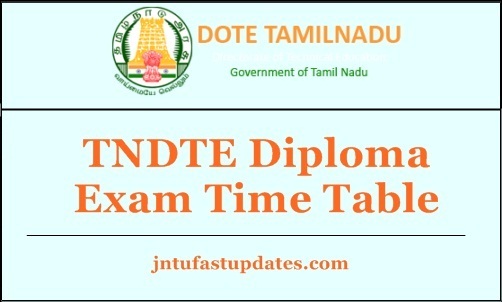 TNDTE Diploma Time Tables April 2019: The detailed Time Table for the TNDTE Diploma 1st sem, 2nd sem, 3rd sem, 4th sem, 5th sem and 6th Semester Courses (K/L/M Scheme), Examination will be held in April 2019 published here with. Tamil Nadu Directorate of Technical Education (TNDTE) released the polytechnic time table for 1st, 2nd, 3d, 4th, 5th and 6th semesters. Aspirants going through the corresponding semesters can check the Diploma Time Table for semester examinations for theory and practical exams. Students can visit the DTE Tamil Nadu official portal, tndte.gov.in and check for the exam schedule PDF file and download it to check the examination dates. Aspirants can also take the printout of the time table and refer it further whenever needed. By reviewing the schedule clearly, aspirants can plan the preparation accordingly. Also, here we provided the direct link to download TNDTE Diploma Odd semester date sheet. By clicking on the link, aspirants will be navigated to the time table page, from where the aspirants can check the exam dates. Tamil Nadu Directorate of Technical Education was established on 14th October 1957. The DTE Tamil Nadu offers various technical courses for the students. In the state of Tamil Nadu, there are 518 Polytechnic/Diploma colleges working under the board. The Department of Technical Education Tamil Nadu follows the semester system in conducting the examinations. Annually, the DTE conducts the even semester examinations (2nd, 4th, and 6th sem) in April/May months and releasing the results in the month of June. And the Odd semester (1st, 3rd, 5th sem) examinations will be held in April months and the result will be declared in the month of December. Aspirants going through Polytechnic, and Diploma courses can check the April 2019 time table details from this article. Aspirants presently undergoing the Diploma in affiliated colleges of TNDTE can check the date sheet from its official website, tndte.gov.in. As every year, the organization is going to conduct the examinations in April month this year. All the hopefuls can go through the TNDTE Diploma/Polytechnic Odd sem time table and take a printout of it for reference. Candidates can follow the process given below to download the time table. Please make sure that all the students and staff are informed about the Time Table and to check the Time Table of April 2019 exam for clash of days, dates / Missing Subjects / Wrong Duration for Examination / Wrong Subject Code / Wrong Name of Subject. Click on April Time Table link. Download Diploma date sheet 2019 [For 1st, 2nd, 3rd, 4th, 5th, 6th semesters] by clicking on the corresponding link. plz send me diploma in mechanical timetable arreares examination 1th year 1th sem maths date. I want know the 5th semester exam date..